Stand up paddle boarding has quickly become one of the most popular sports in the last few months. It’s not hard to see why as the sport is a great blend of exercising and nature, giving people beautiful views while they pleasantly work their bodies. 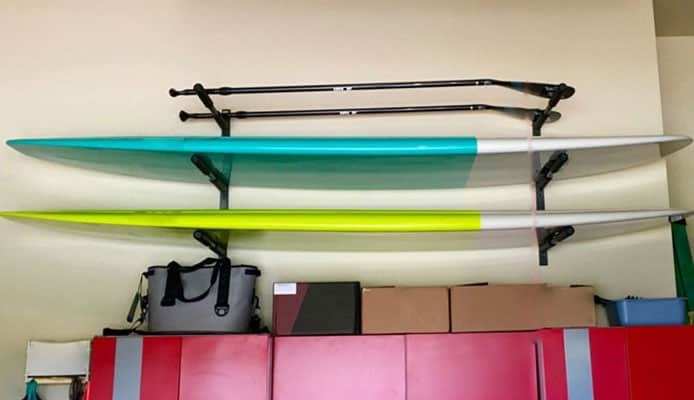 There’s different kinds of stand up paddle boards (SUPs) that need different kinds of storage, but the biggest question every paddle boarder is where and how do I store my SUP? It’s important to always store your SUP somewhere where it will be safe from the sun, heat, and any moisture in the air. This typically means storing it inside, but that’s not always a reality. Whatever you do, just keep your board safe. The “how to” guide on storing your board is a bit more complex. There’s specific ways of positioning your SUP, and a ton of tricks on how to avoid damage and keep your SUP clean. As already mentioned, it’s important to keep your SUP away from sunlight, moisture, and extreme heat. There’s reasons for these things. Your SUP can become discolored and the outside of your SUP can get damaged by the ultraviolet rays that the sun produces. If you can’t keep your SUP inside, make sure you’re storing it somewhere that’s shady. You can also add a sun-protective spray to your SUP, further protecting it if you have any concerns that sunlight may reach it. Mold and mildew breed in damp environments. Besides being disgusting, these growths can also damage the outer part of your SUP, costing you money. Make sure wherever your SUP is stays dry. Extreme heat can cause problems on both the outside and inside of your SUP. The core materials of your SUP can be damaged with heat, and your SUP can also delaminate from heat. Keeping your SUP somewhere shady will also help with heat, but try to keep an eye on your SUP and make sure it isn’t getting too hot wherever you store it. Keeping your SUP stored somewhere inside is the best way to keep your SUP in optimal condition. Whether it’s in your house or in a garage or shed, keeping it inside protects it from the sun, moisture, and heat. If you really enjoy the way your SUP looks, you can even mount it on the wall like a piece of art, making a great conversation starter! Moisture: Ensure that your SUP is protected from the weather, like rain and snow. If you decide to keep your SUP under a tarp, make sure that the tarp won’t be bogged down with water and push down on your SUP. This can also damage it. Sun/Heat: Keeping your SUP in a shaded area is extremely important. If you can’t find anywhere that is shady, suspending a tarp over your SUP can do the trick. 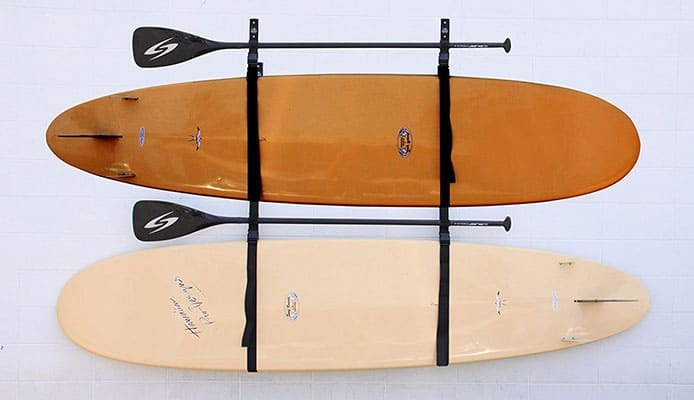 There’s a few different ways that you can store your SUP regardless of where you’re storing it. On a rack: Perhaps one of the most common ways to store an SUP, many paddle boarders either build or buy a rack. The rack should have padding and/or straps to hold the board comfortably without damaging it. Racks come in different shapes and styles, but it’s important to protect the hull of your SUP no matter what kind of rack you have. There’s racks that you can buy that are made specifically for paddle boards, so if you have the money, investing in one is a great idea! Suspended: Another great way to hold your board up is by suspending it. It’ll be out of your way and safe. Like a rail, you can purchase one specifically for SUPs or make one yourself using wide straps. Like always, it’s important to protect the hull of your SUP, so hang it with the hull facing the ceiling. 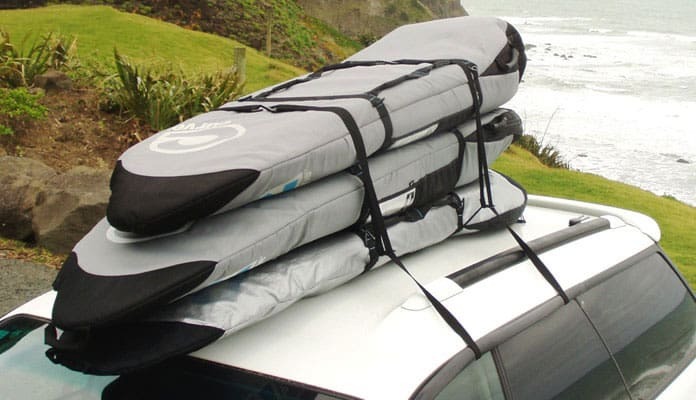 Leaning: Leaning your board against something is one of the easiest and cheapest ways of storing your SUP. Lay your SUP on the tail or its side, making sure that the nose of the board is not on the ground. For extra protection, add some kind of padding on the ground. Some people may not have room for this considering the length of SUPs, but if you do it’s a great solution that’s easy! You can also add some kind of pegs to hold it against the wall to make sure your SUP doesn’t fall down and scare you and hurt the board. All of these are tips and tricks for typical SUPs. However, there are inflatable SUPs that can be stored a bit differently. It’s a good idea to store them like explained above to prevent creasing and deformations in your board, but that’s not always practical. 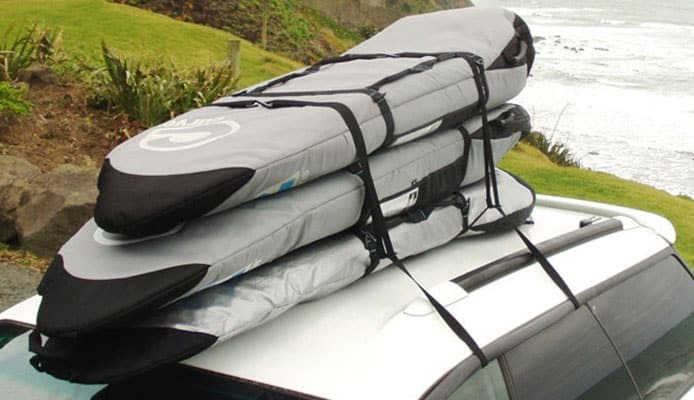 Inflatable SUPs are bought because of their versatility and small size when deflated, so there’s some additional tips to keep your inflatable SUP from harm. First, leave the valve open so any moisture doesn’t yield bacteria inside your SUP. Before storing your inflatable SUP, rinse your board to make sure it’s clean and doesn’t keep dirt kind of rack rolled up with it. If you can, don’t fully compress your inflatable SUP; keeping it rolled up loosely is best to avoid deformations. Just like a regular SUP, keeping it somewhere dry and cool is the best idea. Besides paddle board storage locations, there’s a few general tips to think about no matter the location. Clean your SUP. Whenever you come back from a trip, rinse off your SUP with freshwater to get rid of any sand, dirt, salt, or grim that has come from the lake. Every few months, you should also wash your SUP with a mild soap and water mixture to keep it in tip-top condition. Also make sure your SUP is dry before you store it. Distribute your SUP’s weight equally. This is important since you can deform your SUP by putting too much pressure on one side of it. Consider how easy your storage place is to access. Your SUP was probably bought to be used, and if you have it tucked away in the back of a messy garage or shed, it’ll be discouraging to use it. Make sure that it’s somewhere you (or whoever could be using it) can get to quickly and easily. Think about theft protection. SUPs can be a bit pricey, and if you use yours often, it can become a precious item. 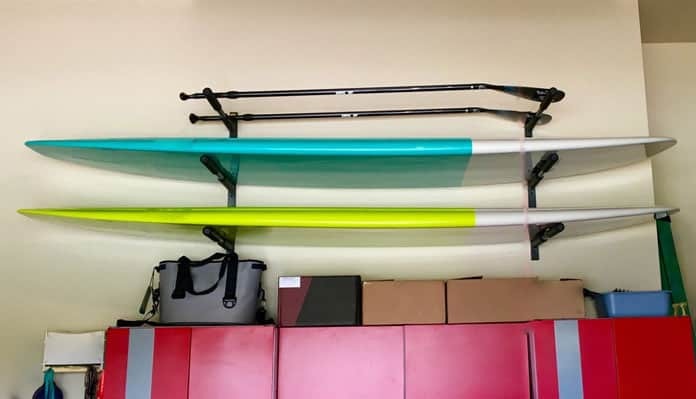 If you have to store your SUP outside, try to keep it as hidden as possible to protect from thieves. It’s also good to make it hard to grab quickly, which can be done by using a security cable through the leash loop on your SUP. There are also locks made specifically for SUPs, so if you have to keep it outside, it may be worth investing in.